The Industries Heaviest Most Durable Ceramic Media !!! P = POLISH: A ceramic media without any abrasives. 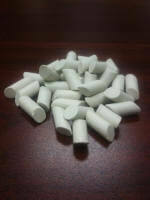 For burnishing, polishing and driving loose abrasive; COLOR: White; WEIGHT: 85-90 lbs. LC LIGHT CUT: For general finishing, light cut and low medium wear. Leaves bright finish when used with proper compounds; COLOR: Gray; WEIGHT: 85-90 lbs. wear. Performs in a wide variety of deburr, deflash and radius applications. Vibra Finish’s most popular formulation; COLOR: Gray; WEIGHT: 85-90 lbs. SF FAST CUTTING: Fast cutting media that provides a good finish with a tough long-wearing bond; COLOR: Gray; WEIGHT: 85-90 lbs. XF EXTRA FAST CUTTING: Media designed for fast metal removal, surface improvements and a low rms finish. Matte finish and moderate wear rate but very efficient due to reduced cycle times; COLOR: Tan; WEIGHT: 85-90 lbs. DF DENSE SUPER FAST CUTTING: Extremely resistant to fracturing, ideal for high energy applications. Very fast cut facilitated by heavier weight per cu. ft. Debur and radius faster than standard medias; COLOR: Brown; WEIGHT: 95-100 lbs. SC SILICON CARBIDE: A media used where aluminum oxide impregnation can not be tolerated such as braising, welding or soldering. Good cutting characteristics and good wear; COLOR: Gray; WEIGHT: 85-90 lbs. removal, radiusing and cycle times are primary concerns; COLOR: Blue Gray; WEIGHT: 85-90 lbs. Other special shapes and sizes are available on special order. Call for pricing and delivery.